by CRYSTOBAL, Gothic Artist. 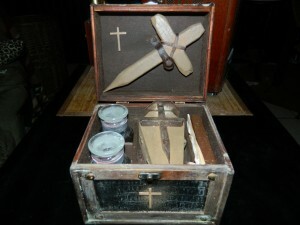 Originator of the modern primitive vampire killing kits for sale now. CRYSTOBAL is represented on Etsy through “Oddities from the Tiki Bar“. This page will be updated as new kits become available. You can also get information on vampire killing kits, cross-stakes, and other accessories by contacting us. Each of these items was hand made, assembled and/or antiqued by infamous Gothic Artist CRYSTOBAL, using his secret techniques and time-honored talents. Each is a true, original design. 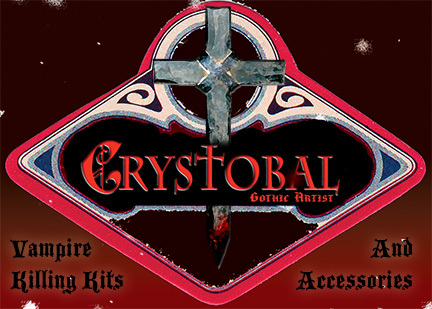 All are one of a kind, as no two CRYSTOBAL Vampire Killing Kits for Sale are ever the same. The Vampire Hunter’s wall-mounted cross-stakes are always similar, but never the same as they are hand-carved and antiqued. 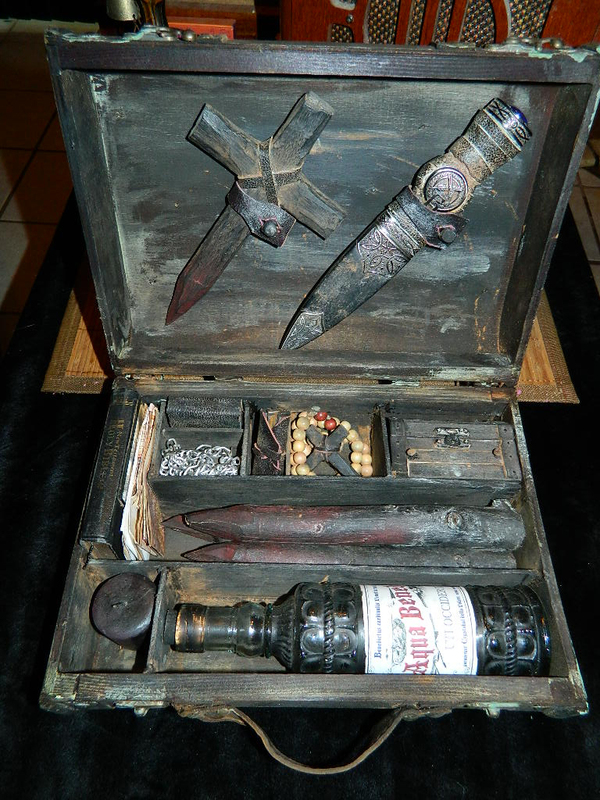 The WWI era US Army military Vampire Killing Kit for Sale is the only one of its kind in the WORLD. We are watching the internet carefully to see when the first copy-cat edition of this kit will be put up for sale! 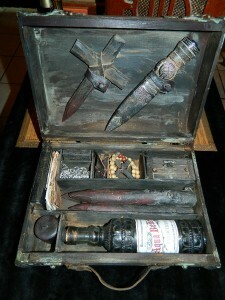 by a kit he saw at a Ripley’s Believe it or Not Museum decades ago, CRYSTOBAL built his first Vampire Killing Kit for Sale long before the general public jumped on the bandwagon. When he sold his first kit on Ebay in 2000, there were no other for sale on the site: except for one absolute fake, which was fraudulently being sold as an original antique vampire killing kit for over $20,000. It was then that CRYSTOBAL decided to make realistic, primitive hand-made style kits. By using new parts and inexpensive yet impressive materials, he was able to make a quality kit while keeping the prices low. On occasion he has been asked to make more expensive kits using real, antique boxes, bibles, pistols etc. For more information on CRYSTOBAL’s vampire killing kits for sale visit our about us page.